Should You Repair or Replace an Older HVAC System? Hot days don’t stop just because the calendar is moving towards fall, and chances are your air conditioner has already been pushed to the maximum for the last few months. Repair calls are quite common this time of year, since older units, having handled daily work for months on end, finally get to the point where they need a repair call. With weeks to go until the weather cools and any problem simply getting worse the more you run the air conditioner, you need to get any problem treated by a professional technician immediately. And we do mean professional. Do-it-yourselfers should never attempt to diagnose or repair an air conditioner themselves. They contain potentially dangerous components like refrigerant which require proper training and licensing to handle correctly, to say nothing of the delicate components inside the air conditioner itself, which can’t be fixed without a thorough understanding of how it all works. That said, you don’t need to be an expert to spot the signs that something is wrong. 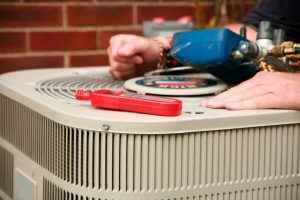 Air conditioners rarely break down without giving some kind of warning sign first, and if you can notice those signs, you’ll be able to act on it before it results in a breakdown. The sooner you act, the better, since the damage usually gets worse the longer you wait to act on it. Low Air Flow. Problems with the fan or fan motor can slow down the air flow through your vents, as can clogs in the filter and blockages or breaches in the vents. Low air flow reduces your system’s ability to cool the home, forcing it to work harder and putting more strain on the AC’s components. Reduced Cooling Levels. Similarly, if the air isn’t as cool as you expect, it could be a problem with low refrigerant levels, an overheating component, problems with the vents or a host of other issues. The air emerging from the vents needn’t be hot to indicate a problem: merely less cool than you were expecting. Strange Noises. You’re likely very accustomed to your air conditioner making specific noises when you turn it on. Any noises that don’t match those sounds should be cause for concern: hums, clicks, clangs, groans or anything else that doesn’t sound normal. In most cases (though not all) the noises will start and stop with the starting and stopping of your air conditioner. If you need air conditioning repair in your Glendale, CA home, turn it off immediately and call in the professionals at Greenleaf Heating & Cooling today!